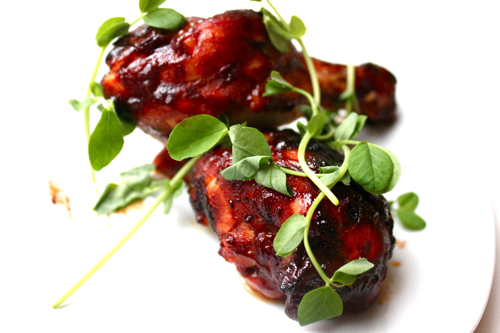 These chicken legs are so easy to make and so delicious to eat. There is no reason for you not to go make them right this second. The chicken is calling you. Do it!! Just preheat your oven to 450°F. Place some chicken legs in an oven proof dish. Cover them in BBQ sauce, spreading it all around so they’re fully coated. 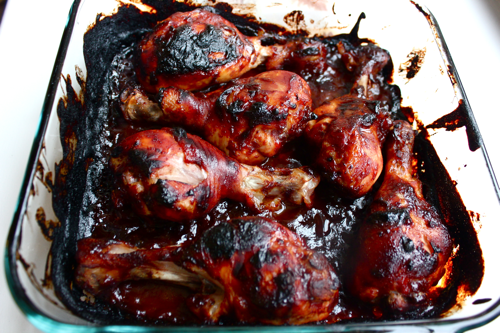 If you have more than .5 seconds on your hands, consider marinating the legs in the sauce first. Then, bake them in the oven for 20 minutes. Turn the legs over, baste them with the BBQ sauce, and bake them for another 20 minutes. By then, the meat should be about to fall off the bone, begging to be eaten. 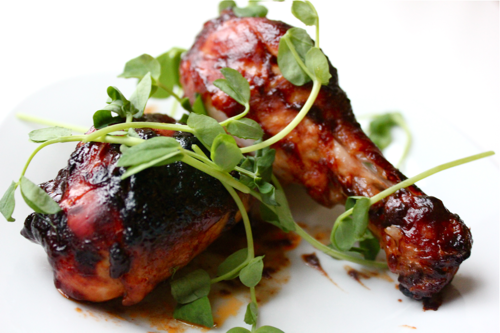 Top the chicken legs with pea shoots for a little bit of crunch and fresh flavor. I got the pea shoots in my vegetable delivery, but I also saw them at Trader Joe’s. Gobble them up. Then lick your fingers. 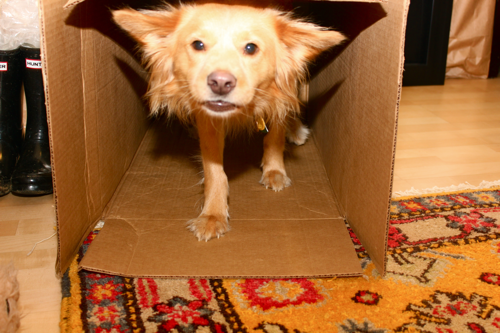 And remember– Nobody puts puppy in a box! Not even after she snatches these legs right off your plate.